Kingston has introduced the second-generation of its popular entry-level SSDNow V series, giving budget shoppers even more bang for their buck. The original SSDNow V100 launched precisely one year ago and has been the go-to boot drive for many cash-strapped enthusiasts, but the drive is certainly showing its age with its SATA 3Gb/s interface and JMicron JMF618 controller. The new SSDNow V200 comes in the same 64GB, 128GB and 256GB capacities as its predecessor, but connects via the SATA 6Gb/s interface and receives an updated JMicron controller. Unfortunately, we haven't found detailed information about JMicron's new 6Gb/s controller, but we assume it's the chip announced in July, which was expected to be shipping around now. 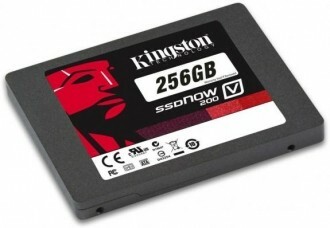 As with the previous generation, Kingston's 64GB SSDNow V200 is the slowest in the pack with sequential read and write speeds of up to 260MB/s and 100MB/s. That's not particularly better than the 64GB V100's read and write rates of 250MB/s and 145MB/s, but the synthetic AS SSD Benchmark results provided by Kingston show nearly a two-fold increase in performance. Likewise, the 128GB V200 offers peak reads and writes of 300MB/s and 190MB/s while the 256GB can hit 300MB/s and 230MB/s, whereas the V100 in those capacities were quoted as having 250MB/s and 230MB/s. The newer drives are shown to have nearly double the performance in AS SSD Benchmark, but the real world results could be quite different as we've seen in the past. The new lineup is backed by a three-year warranty and should launch this month as a standalone drive or in upgrade packages for desktops and notebooks with brackets and cloning software. Kingston is mum on pricing, but the company's press release claims that the V200 series is "up to 20 percent less in price than its predecessor." Hopefully that's reflected in retail pricing.